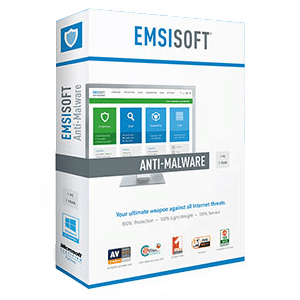 Emsisoft provides strong malware protection against viruses, spyware, infected emails and other malware. and on our best antivirus software list this year. issue on our test systems and it will not require Reboot. 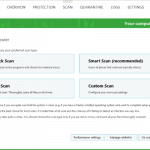 After the installation complete, Emsisoft will update the antivirus definitions and running a full scan, Surf protection basically consists of a database that contains the addresses of dangerous websites. When you access a website, Emsisoft Anti-Malware checks if the address is already known for spreading malware, and if so, gives you a warning instead of loading the site. This feature may sound simple at first, but there is a lot of work involved in keeping the database up-to-date. At the end of March 2015, Emsisoft Anti-Malware knew of more than 160,000 potentially dangerous websites, and more are being added every day. These are categorized into phishing (52%), malware-spreading (31%), exploits (7%), advertising/tracking (6%), hijacking, warez, and fraud. Surf protection is the first layer of defense that prevents malware from entering your PC. Tests prove this layer of defense alone wards off a significant volume of current threats, as infected websites are one of the primary sources of infections. In addition, it also protects you against scammers who use fake websites to try to gain access to your savings. 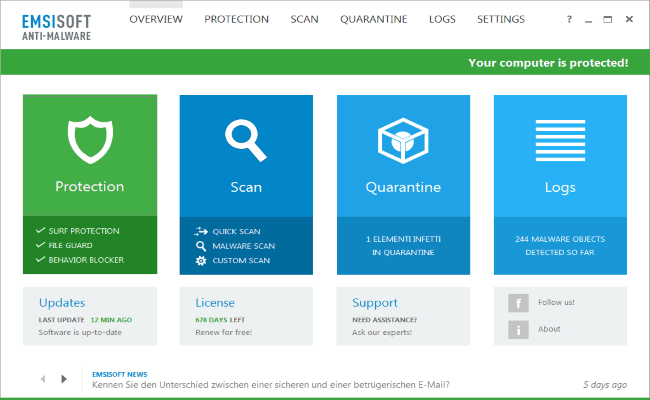 Emsisoft Anti-Malware is a premium malware scanner to clean and protect your PC from viruses, spyware, Trojans, bots, adware and worms. It uses 2 major scan engines (Emsisoft’s own one + BitDefender antivirus) to find more than 10 million different types of malicious software. 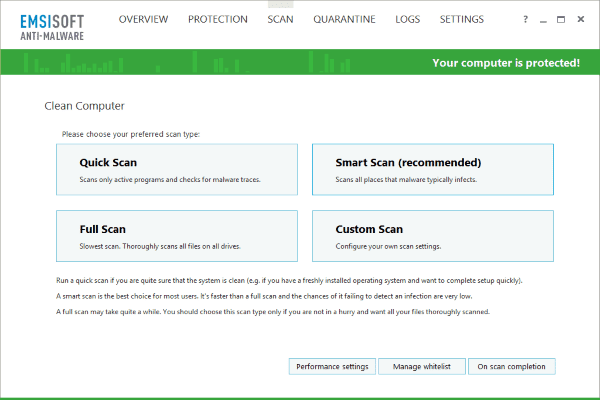 Keep your PC clean with the included File Guard and Behavior Blocker features that effectively stop all new infections. The Surf Protection additionally blocks access to fraudulent and dangerous websites. Emsisoft Anti-Malware was awarded as best in test of AV-Comparatives Real-World Protection tests and MRG-Effitas Real world Tests. Many other independent tests since then like VB100 and MRG-Effitas best performer in all zero-day malware tests 2013, 2014 and 2015, confirm the world class level in virus detection. 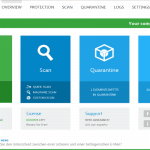 The Emsisoft Anti-Malware real time protection uses 3 layers to protect your PC against new infections, The signature based scan will know dangers files immediately when they try to run or are being downloaded from web. New malware definitions (signatures) updates are available at least 24 times per day. 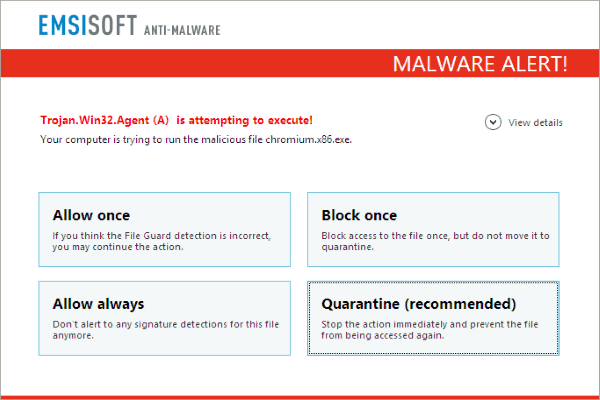 With the awarded unique behavior based malware detection, all running programs are monitored all the time. As soon as a program does something suspicious, it is stopped and alerted. Providing you the ability to interrupt unwanted actions. That provides extra security against new and unknown threats that others can’t catch. The surf protection prevents you from surfing to malware spreading and fraudulent websites. 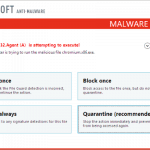 Extras: Emsisoft Anti-Malware holds plenty of advanced options for experts to detect and delete malware manually.